Be Warned! – As you might expect, chocolate features heavily in this special edition Easter Foodie Round Up – there’s a lot of it about right now! 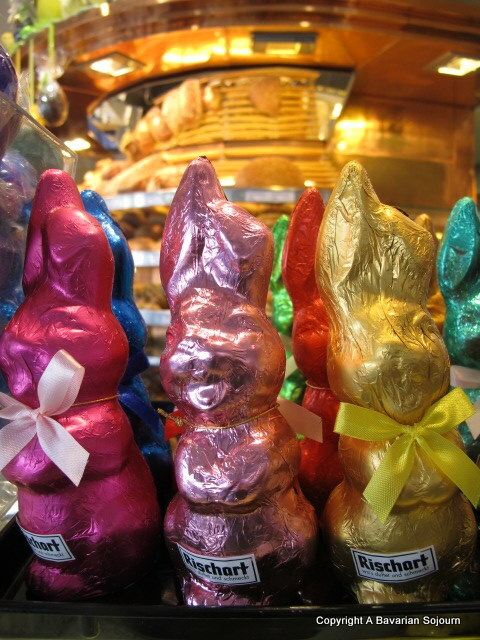 Of course in this part of the world, consumers also go hopping mad for traditional Easter sweet treats – in Hare form – for there is no Easter Bunny here, the usual Easter eggs in all shapes and sizes, or in oven defying cake form as demonstrated by Proud Italian Cook’s Easter Lamb Cake and which I have yet to attempt. But Dear Reader, this year I shall be at home for Easter, and my thoughts are currently dominated by which of the much missed food stuffs will be forming our English Easter Feast! You can guarantee that I will be taking inspiration from the recipes featured below! Starting off with something for Easter Breakfast – Lavender and Lovage’s Raspberry and Vanilla Easter Pain Perdu, giving you one of your five a day in raspberry form before you get started on all that chocolate! That’s unless you decide to make this Creme Egg Pancake Stack instead of course. Now what to cook for the big lunch? Many people will stick to the traditional Easter Lamb so here are few variations to inspire you… Housewife Confidential has a Shoulder of Lamb with Herb Rub and Boulangere Potatoes I am pinching her beautiful Spring Wreath idea too. The Kitchen Shed has a Slow Cooker Lamb Shank recipe that looks divine, she also has a great Rosemary Potato recipe whilst you are there and Mari’s World has a completely different style of slow cooker recipe in Lamb Dukkah form – which sounds delicious! If you fancy something to serve with your Easter Lamb, might I suggest my very own or rather my 7 Year Old’s Wild Garlic Pesto which would go well even if I do say so myself? Of course not everyone likes lamb and there are plenty of other options – how about Hot & Chilli’s Ox Cheeks in Red Wine? Or Anyonita Nibble’s Crock Pot Apple Pie Chicken with Turmeric Rice? For the pescetarian’s amongst us – you could try Delicieux’s Smoked Haddock with Poached Egg and Cheesy Vegetables and for a vegetarian option I love this gorgeous Spring Primavera Risotto from FashionFoodandFlirts! I also had to give My Little Italian Kitchen’s Easter Bread a mention as this has to be the perfect centre piece for any Easter table! This next section is dedicated to the glorious Hot Cross Bun – for Easter wouldn’t be Easter without at least 25 having been consumed in our house and that’s just me! Utterly Scrummy’s version is not only Chocolate but has a little secret inside too! Cake Hunter’s Lemon and White Chocolate buns sound like a nice change from the usual, as do What Kate Baked’s Date & Orange versions. Not so keen on sweet? No problem, how about What Jessica Baked Next’s Cheese Hot Cross Buns for a change? Whilst on the topic of Easter Baking – who can say no to a bit of Simnel Cake? Here are two to try: – Mrs Portly’s Kitchen’s Simnel Cake, and Miss Foodwise’s Simnel cake – a slice of each please! Now onto the all important eggs – not of the chicken variety, but the chocolate. Let’s begin with Mini Eggs – I’m Counting UFOs Chocolate Dipped Easter Biscuits would make a great kids baking activity, as would My Family Fever’s Easter Cakes Jibber Jabber’s Easter Chocolate Cupcakes look better than any shop bought variety – and probably taste ten times better too! Now onto a slightly larger egg that does also happen to exist in mini form. Over A Cuppa’s Creme Egg Sponge Pudding would be the perfect Easter Lunch dessert, but then again so would this Creme Egg Chocolate Quiche invented by Mammasaurus. I guess you could make one for dinner and another for lunch? Time for a bit more chocolate before we go… I am slightly in love with these amazing White Chocolate Coconut Mousses from My Golden Pear and Honest Mum’s Chocolate Torte is also pretty tempting. I think I might have to sit quietly with a Passion Fruit Martini from Super Golden Bakes whilst I decide. There is no theme for next month as I will be concentrating all my foodie attentions on the BIB Foodie finalists, whoever they might be!! Hi Emma, thanks so much for including my chocolate torte, we’ll definitely be making it again this Easter-will go discover all the other gorgeous sounding recipes now!